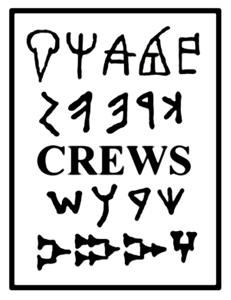 At the CREWS project we are conducting new research on ancient writing systems, but the research itself is only one aspect of what we do. There’s no point in finding things out if you don’t communicate them after all. And we love passing on our enthusiasm for ancient writing! That is why we are trying to develop our outreach activities and teaching materials (see more below), and we also report on these aspects to our funding body, the European Research Council. We want to hear from YOU. Have you used CREWS blog posts in a teaching capacity (e.g. in school or university or just with the kids at home)? Have you used our write-your-name sheets? Have you encountered us at an outreach event? Do you have any requests or resommendations for us? We have finally come to the last object in our special display at the Fitzwilliam Museum. Don’t be too sad yet though, because there is still more than a month to come and see it (until 10th June 2018) if you have a chance to visit Cambridge. This week’s object is a little stamp seal from ancient Cyprus, featuring a fish-man with Cypriot Syllabic writing behind him to the top-left, probably 7th-6th C BC. At just 2.1 x 1.2 cm, it’s the second smallest item of our set. Now part of the Fitzwilliam Museum’s own collection, we do not know exactly where it came from but its Cypriot provenance can be confirmed because of its Cypriot Syllabic inscription. Coming up to the season 8 finale of one of my favourite TV shows, The Walking Dead, my mind has been lingering on something other than the fear of main character deaths and the elusive potential for the good guys to find peace with the current bad guys. The curse of being an epigraphist is that I’m always looking out for signs of writing and the contexts in which writing is used – which is, of course, exactly what I’m working on in my day job (albeit for the ancient world rather than a post-apocalyptic alternative reality). So as I’ve been watching The Walking Dead, I’ve started asking myself: in a world where the dead are everywhere and society has changed radically, what might that mean for reading and writing? For TWD fans, beware of a few (fairly mild) SPOILERS if you keep reading – including for season 8, but not the finale. All images in this post are copyright of AMC. For this week’s inscription post based on our CREWS display at the Fitzwilliam Museum, we’re going to be revisiting ancient Cyprus – this time in a much earlier period than we discussed for the Idalion Bilingual. This little item might look unassuming (it’s only a couple of centimetres in diameter, don’t be fooled by the photo! ), but it is very important for trying to understand the earlier development of writing on Cyprus. Image courtesy of the Trustees of the British Museum. A new published article based on my CREWS project research has just appeared in print, with a focus on non-administrative documents written in Linear A. • ‘Writing ‘systems’: Literacy and the transmission of writing in non-administrative contexts’ in Jasink, E.M., Weingarten, J. and Carraro, F. (eds.) Non-scribal Communication Media in the Bronze Age Aegean and Surrounding Areas: The semantics of a-literate and proto-literate media, Periploi 9, Firenze 2017, 81-100. With the new season of Game of Thrones starting, I have been thinking about writing and literacy in the world of the show. NB This post contains NO SPOILERS FOR SEASON 7! Please note also that copyright for the books belongs to George R R Martin, for the show to HBO and for the created languages to David J Peterson. The novels in the A Song of Ice and Fire series by George R R Martin give lots of hints at linguistic diversity in both Westeros and Essos. In the books, very occasionally a word or short phrase appears from one of the other languages (i.e. ones other than the ‘Common Tongue’, represented by English in the show). Probably most famous is valar morghulis, meaning “all men must die” in High Valyrian. But for the most part the books only signal the existence of the languages without giving any details. The show, made by HBO under the direction of David Benioff and D B Weiss (see the official website), takes the languages of Essos a great deal further. They employed a linguist, David J Peterson (see more HERE), to develop George R R Martin’s hints into fully fledged, constructed languages that could be used in the show with subtitles to show us what the characters are saying. This post, however, is going to focus not on languages specifically but on writing. I hope these thoughts on various aspects of writing and literacy, drawn from my watching of Game of Thrones over the last few years, will prove interesting!